Home theater buffs now have a new graphics card option for gaming in the living room—the Radeon RX 460. MSI updated its website with two models, one with 2GB of onboard GDDR5 memory (MSI RX 460 2GT LP) and one with 4GB of memory (MSI RX 460 4GT LP), both on a 128-bit bus. Outside of the memory configuration, the specs are the same for both cards. The new low profile variant is intended for slim HTPC cases where there is not a lot of vertical space to worth with. It takes up two slots and, unlike many low profile cards, it sports a dual-fan cool cooler. As with many of MSI's products, the low profile Radeon RX 460 uses "military class 4 components," which means both models only use MIL-STD-810G certified parts, including all solid capacitors with an aluminum core design. The Radeon RX 460 is based on AMD's Polaris 11 GPU architecture with 896 stream processors, 48 TMUs, and 16 ROPs. MSI's low profile version sticks to AMD's reference speed of 1,200MHz (boost). That's good enough to play most games at 1080p, though if you prefer to crank up the eye candy and game at higher resolutions, you'll need something faster. Other than being shorter than standard Radeon RX 460 graphics cards, these low profile models also have a new I/O bracket with just two video outputs—HDMI and dual-link DVI-D.
MSI did not say how much these low profile models will cost or when they'll be available. 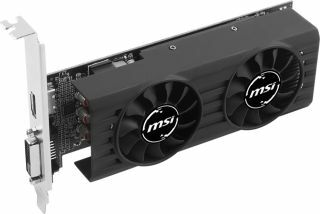 As a point of reference, MSI's single-fan Radeon RX 460 2G OC card sells for $100 on Newegg.